The holiday season will be here before you know it. Forego your yearly trip to the drug store searching for the perfect holiday card. Create your own using your favorite photos. Furthermore, you can add your own holiday message and choose from a wide variety of templates ranging from traditional to modern. 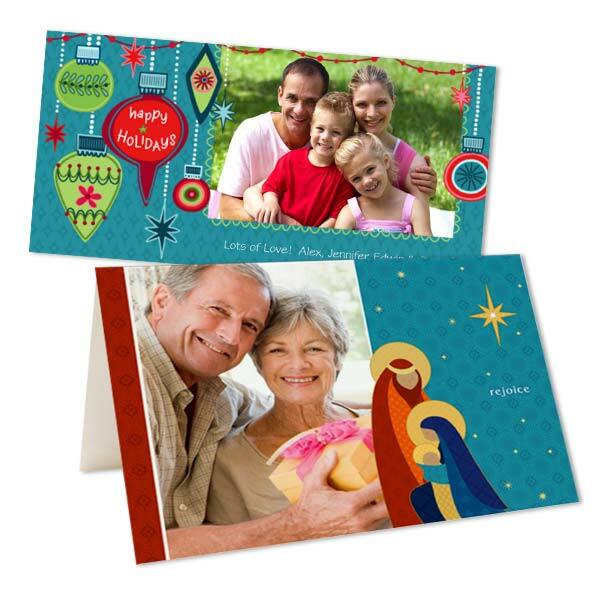 Use our online card maker to create photo holiday cards in minutes! Our cheap photo holiday cards are not only affordable; they’re printed on the best quality paper. Our greetings have that professional look like you’d find with store-bought cards. In contrast, they’ll be printed with your own photos or artwork for a personal touch. Upload wedding photos, last year’s family holiday snapshots, or a few photos from the past year to share your memories with family and friends during the holidays. Finally, you can choose from three classic card styles! If you’re looking for cheap photo cards, our glossy photo paper option is best! Printed on silver halide photo paper, they feature your favorite photos in the boldest colors. Maybe you prefer cardstock photo cards instead. Our double sided option is perfect for a collage on the front and your own holiday message on the back. Or, go traditional with our folding holiday card option. As you can see, we have a wide range of options to select from so you can create a greeting that reflects your personality and style! Check out our personalized Christmas cards and custom photo Hanukkah cards for even more ideas! We have card designs in a variety of styles waiting just for you!